"Hunger Games" Earns $21.5M to Slap Down "Stooges"
Jennifer Lawrence stars as 'Katniss Everdeen' in "The Hunger Games"
Movie fans have chosen real violence over the slapstick variety as "The Hunger Games" held off "The Three Stooges" to remain the No. 1 weekend movie. Lionsgate's "The Hunger Games," the blockbuster about teens competing in a televised fight to the death, stayed on top for a fourth-straight weekend with $21.5 million. That raises the film's domestic total to $337.1 million. "I think a couple of weeks ago, if someone had told us where we'd be, we would have said, 'We'd like to see that number, but it would be a pleasant surprise.' So we're in that pleasant surprise spot at this point," said Richie Fay, head of distribution for Lionsgate. Peter and Bobby Farrelly's slapstick update "The Three Stooges" opened in second-place with $17.1 million, according to studio estimates Sunday. That was well above industry expectations of around $10 million for the 20th Century Fox update starring Chris Diamantopoulos as Moe, Sean Hayes as Larry and Will Sasso as Curly. Fox executives had figured the movie would appeal mainly to young males. But it also pulled in older men who grew up on the Stooges and a fair number of women and girls as whole families turned out to see it, said Chris Aronson, the studio's head of distribution. "If you're predisposed to open your mind, it's a laugh riot," Aronson said. The acclaimed horror tale "The Cabin in the Woods" debuted in third-place with $14.9 million. A smart, twisting take on the genre produced and co-written by Joss Whedon ("Buffy the Vampire Slayer"), the long-delayed "Cabin in the Woods" had been one of the films caught up in MGM's bankruptcy but was finally released by Lionsgate. On the 100th anniversary of the ship's sinking on April 15, 1912, the 3-D version of James Cameron's "Titanic" sailed past the $2 billion mark worldwide. "Titanic" is just the second blockbuster to top $2 billion, trailing only the next film Cameron made — the sci-fi sensation "Avatar," which took in $2.8 billion. Domestically, "Titanic" held the No. 4 spot with $11.6 million. The 3-D re-release has taken in $44.4 million domestically to lift the film's lifetime total to $645.2 million. "Titanic" also pulled in $88.2 million in 69 overseas markets, including a huge $58 million 3-D debut in China. That brought the 3-D reissue's overseas total to $146.4 million and the worldwide sum for re-release to $190.8 million. Added to the $1.84 billion take from the original release of the 1997 hit, "Titanic" has climbed to a lifetime total of about $2.03 billion. Another big overseas haul came with Universal's "Battleship," which opened with $58 million in 26 countries five weeks ahead of its U.S. debut on May 18. The action tale featuring Taylor Kitsch and Liam Neeson is inspired by the game Battleship. "The Hunger Games" added $15 million overseas to bring its international total to $194 million and its worldwide haul to $531 million. The weekend's other new domestic wide release, Film District's sci-fi story "Lockout," opened at No. 9 with $6.3 million. The movie stars Guy Pearce trying to quell an uprising at an orbiting space prison. With no big new debut on the domestic front, the overall box office slipped for only the second weekend this year. Domestic revenues totaled $117 million, down 10 percent from the same weekend last year, when "Rio" led with $39.2 million, according to box-office tracker Hollywood.com. Domestic revenues this year are at $2.98 billion, 19.3 percent ahead of 2011's, putting Hollywood on a record money pace with a big summer lineup just weeks away. The superhero tale "The Avengers" kicks off the summer season May 4. Revenues may continue to lag over the next couple of weeks compared to last year, when the action hit "Fast Five" boosted business just before the summer season. "This year, we don't really have something like that, but with the 20 percent lead we have over last year, we don't really need it. We are in terrific shape going into summer," said Hollywood.com analyst Paul Dergarabedian. 1. 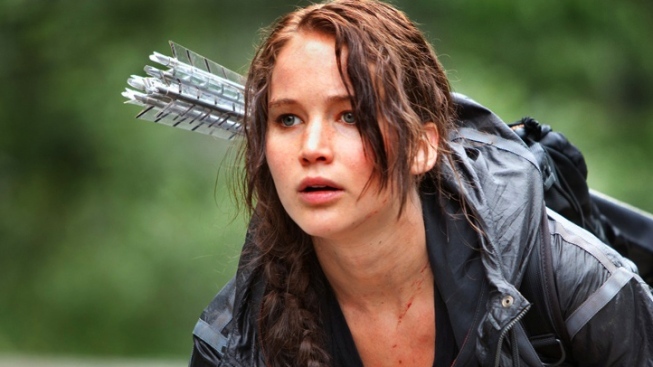 "The Hunger Games," $21.5 million ($15 million international). 2. "The Three Stooges," $17.1 million. 3. "The Cabin in the Woods," $14.9 million ($3.4 million international). 4. "Titanic" in 3-D, $11.6 million ($88.2 million international). 5. "American Reunion," $10.6 million ($11.8 million international). 6. "Mirror Mirror," $7 million ($10.2 million international). 7. "Wrath of the Titans," $6.9 million ($16 million international). 8. "21 Jump Street," $6.8 million ($4 million international). 10. "Dr. Seuss' the Lorax," $3 million ($8.6 million international).